Welcome to Dikra Gem Online, a colorful reminder of the expansive range of items we carry. The familiar to the unusual; calibrated to freeform. We offer you faceted stones, cabochons, strands of pearls, individual pearls, drusies (natural, dyed or plated), 1/2 drilled drops, tongues, bullets, pendants, and “designer” SBBT’s & cabochons. 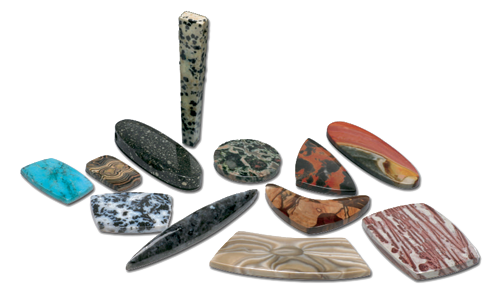 We strive to acquire interesting rough, cut it well and offer the finished stones at competitive prices. Call, fax or email us with inquiries or requests. Not all shapes or sizes are available in all stones. If you are interested in a particular color, shape or size not in stock, it can be ordered for you. Such orders depend upon the availability of the material and if the material is suitable for the size and shape requested. There is a minimum quantity requirement for some special orders and there may be a time delay. A deposit may be required. 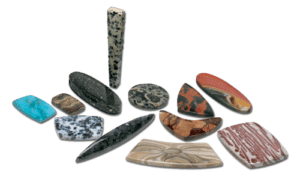 There may be a surcharge of approximately 20% above production price for counter samples if required by the cutters. We offer discounts, and special pricing based on quantity. Our inventory is always changing. We accept Visa, Master Card, American Express and Discover. Wholesale Accounts: We offer terms to JBT rated accounts. If you are not currently listed, please furnish several trade references. Retail: Students and retail customers welcome!